Time to lace up those sneakers, hop on TriMet and head to the premier indoor track and field events of the year. 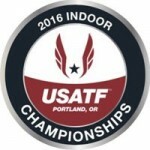 Portland plays host to the 2016 USA Track & Field (USATF) Indoor Track & Field Championships March 11-12. Then right on the heels of that competition comes the International Association of Athletics Federations (IAAF) World Indoor Championships March 17-20. It is the first time in nearly 30 years, and only the second time in history, that the IAAF World Indoor Championships are being held in the United States. Both USATF and IAAF championship contests will be held at the Oregon Convention Center, which is served by the MAX Blue, Green and Red lines, as well as the Line 6-ML King Jr Blvd bus. The MAX Yellow Line and a handful of other bus lines stop a short distance from the convention center. Plan your trip to the convention center. During the world championships, a medals ceremony-turned party will be held Thursday and Friday evenings and on Sunday afternoon at Pioneer Courthouse Square. Enjoy the free celebration. All MAX lines serve the Pioneer Square area and run between the Square and the convention center/Rose Quarter areas. Bus lines 4, 8, 35 and 44 also run between the convention center and Pioneer Square areas. Plan your trip to the Square. Whether on the TriMet system, at the Square or the convention center, or elsewhere in the vicinity, be aware of your surroundings and the people around you. If you see something suspicious, say something. Either alert a police or security officer nearby, call 9-1-1 or tell a TriMet employee. 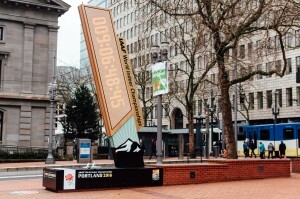 Portland will be on the world stage as hundreds of athletes and their fans from around the world will be in town. MAX trains and buses running in the evening from the convention center to Pioneer Square may be crowded, so please move into the vehicle rather than crowding the doors and remember seats are for sitting, not belongings. Fares are required on all TriMet vehicles. The TriMet Tickets mobile app makes your phone your fare. Easily purchase and use tickets and passes instantly on your phone — anywhere, anytime. Just download the free app, register your debit/credit card in our secure system and you’re ready to buy, activate and go. Learn more at trimet.org/mobiletickets. Pioneer Courthouse Square is expected to be busy as people gather for the medals ceremonies and to enjoy free music along with food and beer. Please pay attention and stay alert when crossing MAX tracks and streets. It takes just a moment to be aware and look both ways.